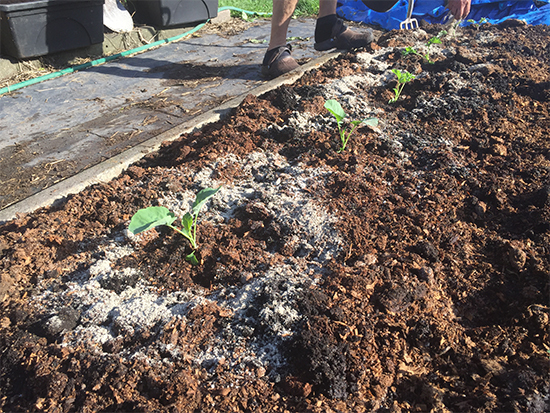 With the cooler nights and a good drop of rain, it’s time to plant the brassicas. 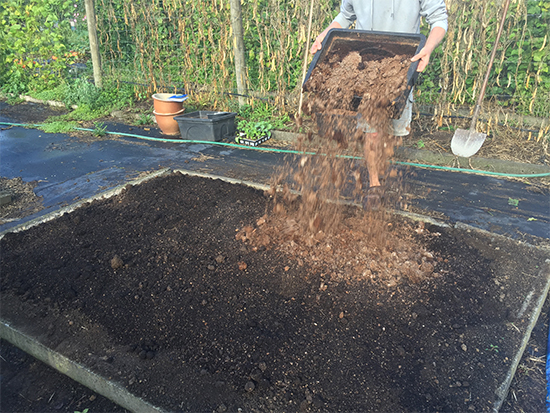 After weeding and forking over the bed to aerate the soil, we add some good compost and animal manure. The Hungry Bins are fairly full, so this is where we’ll get our compost. 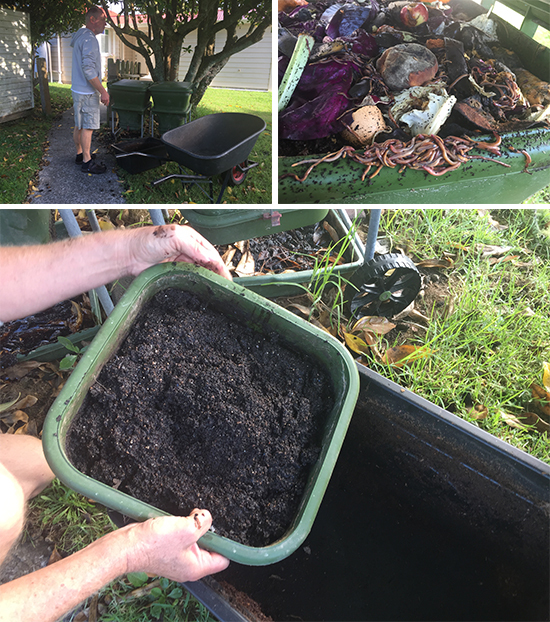 There’s no other worm farm that works quite as well as the Hungry Bin. Our animal manure is well-rotted chicken manure. 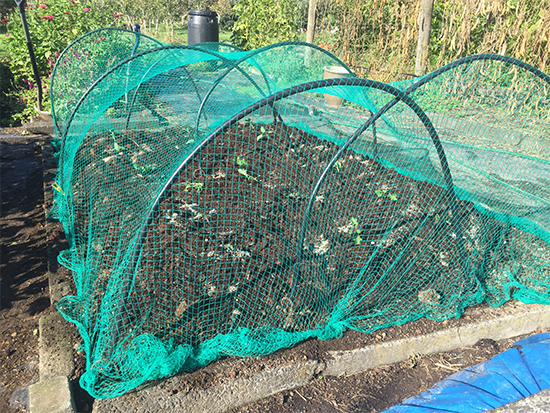 All brassicas are heavy feeders and will never do well in poor or compacted soils. If your soil is too acidic, add some garden lime which also adds calcium – an important element in the soil. We try to keep our soil between pH5-6 as most vegetables like this range. If your soil is in this pH range, we recommend adding some gypsum or a fertiliser that has a high calcium content. Here we’re planting broccoli and kales. 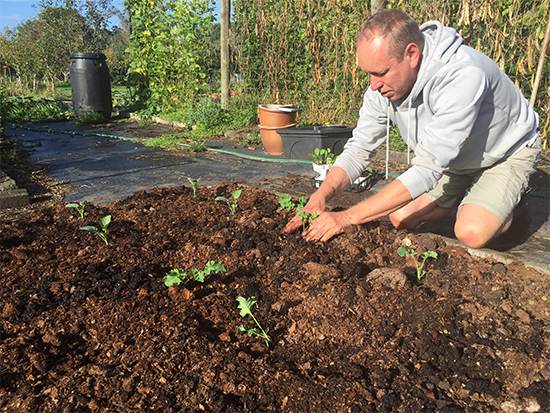 Sprouting broccoli is a great plant for the home gardener as you can pick it over a long period of time. 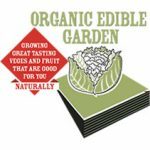 There’s also a purple variety which seems to grow larger than the green one and gives you a great crop – something different!. 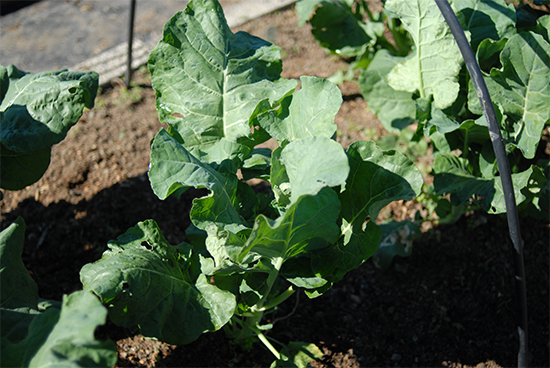 The kales can be planted closely together but broccoli needs space between the plants. 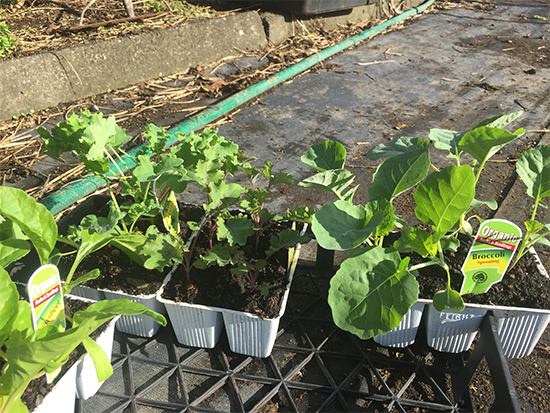 Other brassicas that can be planted now are cabbages, cauliflowers and collards. 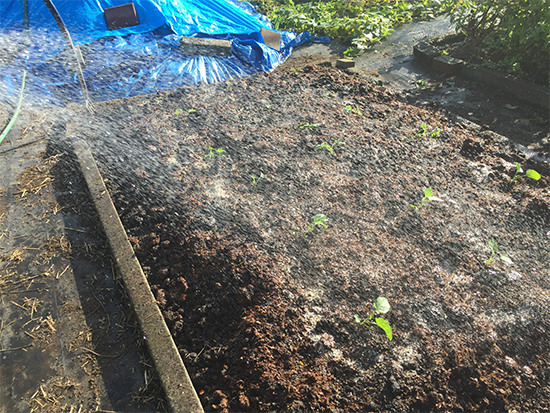 After planting our crop, we give them a side dressing of our organic fertiliser made of volcanic rock dust and seaweed. This ensures our plants will be healthy and strong. Caterpillars and butterflies are going to be our main pest while the weather is still warm. To combat that, we apply neem granules round the plants. Neem is a good soil conditioner as well as strengthening young plants against attack. As the ground is still dry deep down, a good watering is important. This also helps bed in the plants. 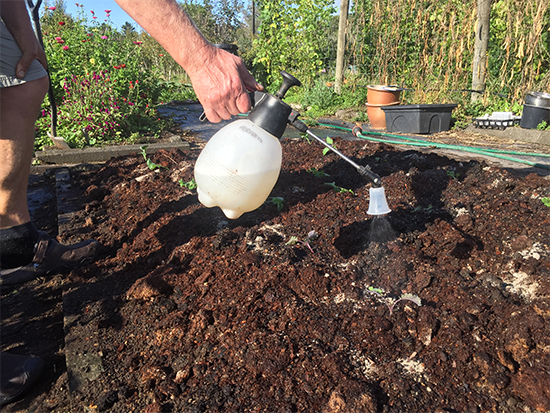 Then we give them a spray of Btk, sold in garden centres as Organic Caterpillar Bio Control. We’ll give them a weekly spray of this until the weather cools down enough for the white butterfly to die off. Lastly, we cover the beds with netting. This stops not only the butterfly but also birds and other animals from destroying the garden. And where there’s some space, plant a few flowers to feed the bees and other good bugs. 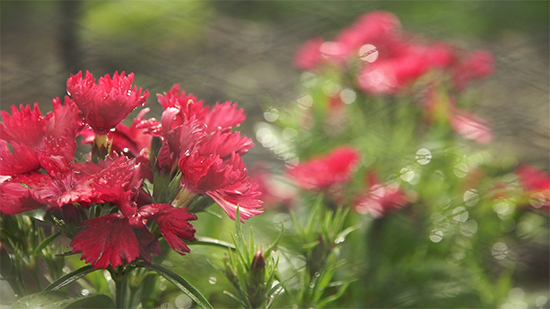 At this time of year calendula, alyssum, viola, dianthus and snapdragons are good companion plants. From Rob, Jan and the Team at OEG! Also why do you spray as well as net and using neem. I thought the nets would keep the butterfly from the plants? Hi Maria Mitre 10 sell the sprayer. It’s called a Solo Mini Sprayer. The nets do detract the white butterfly, but occasionally one will slip through the netting. No one method is 100% which is why we use a combination approach. Thank-you thank-you and thank-you again. I loved learning how to make the steel and hose covered frames. I won’t even need to get my husband to make them 🙂 So easy after watching your video. Enjoyed the hint regarding Neem Oil take-up by the plant roots of the brassicas, and of course all the other advice. Thank you for the great advice! I am going to try and put all that into practice.